It’s been a long time since the last update! Nothing happened with the computer for quite some time but eventually I found some time to work on it again. All that is really missing now is a dvd drive and possibly putting an ethernet jack on the back of the machine. It’s wifi-only at the moment, using an ethernet->wifi dongle. I redid the Minimig controller, removing the need for the original PIC controller. The main controller is now a Teensy 3.0. This one was chosen because has 12Mbit/s bandwidth over USB – this is good enough for floppy disk transfer between MorphOS and the Minimig. It has a custom firmware that allows the Minimig to be completely controlled from the client software running on MorphOS, including reading floppies, getting input, changing settings, and so on. Multi disk games are automatically detected from the filename, and it is possible to override any setting on a per-game basis. 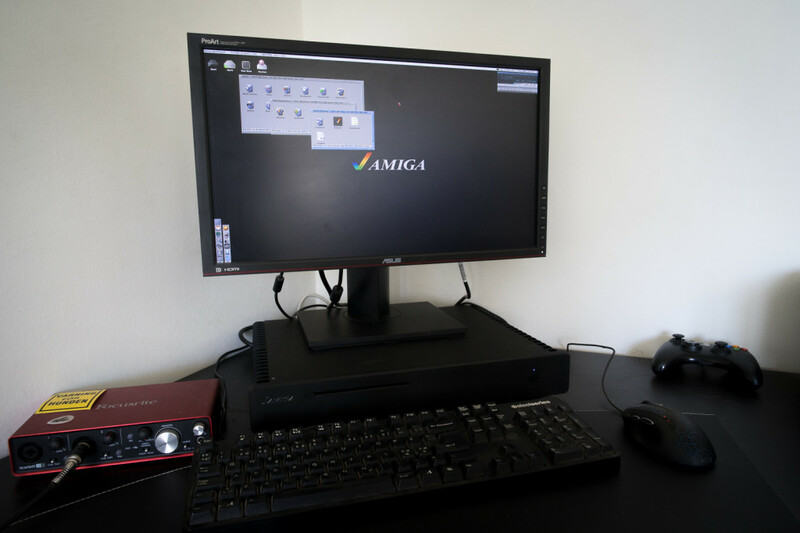 Mouse, Keyboard and gamepad input are forwarded from MorphOS to a second microcontroller, an Arduino Mini, which emulates a PS/2 Keyboard, Mouse and the Amiga joysticks. 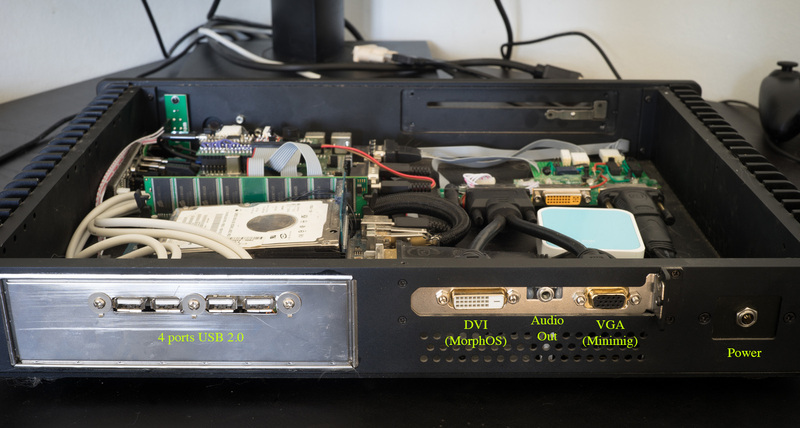 There is no OSD like on the stock Minimig. Instead there are special key combinations to press for resetting, changing certain settings and so on. An ini file is used for setting default settings and it is possible to override any of these on a per game basis. Multi disk games are automatically detected by filename, and it’s again possible to specify disk settings in the ini file. I was not happy with the previous version of the video switch as it required me to use analog output from MorphOS. The new version is a hacked DVI switch I got for cheap from ebay. 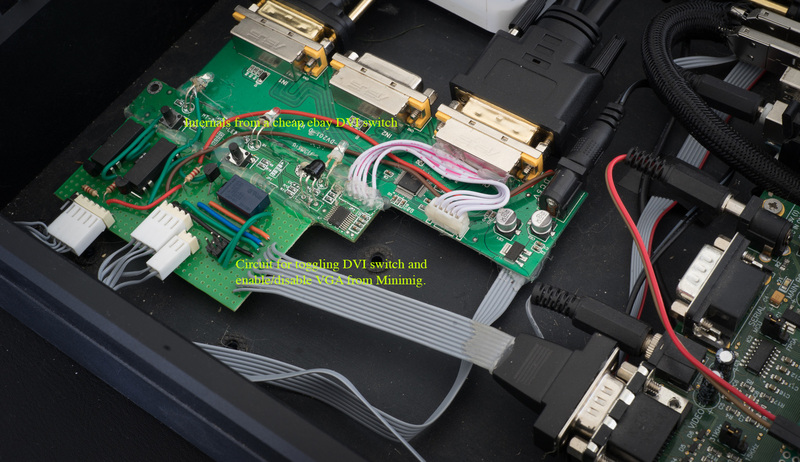 Hacked in a way that it outputs DVI-I with either digital signals from MorphOS or analog signals from the Minimig – never both at the same time. 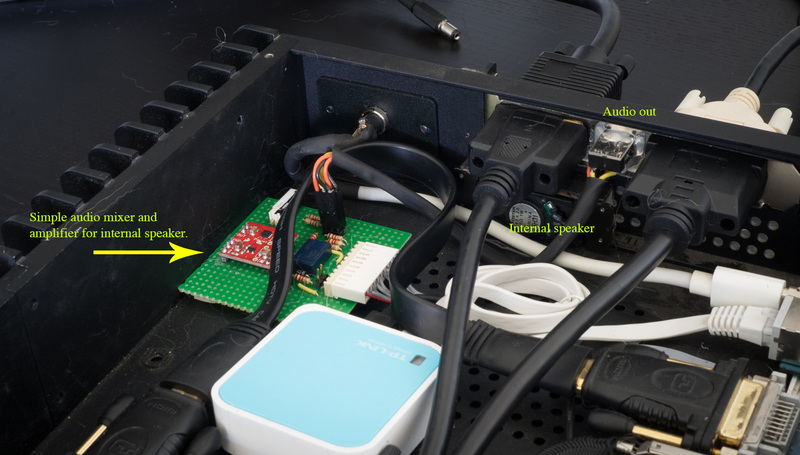 My monitor automatically detects if a cable is “unplugged” or “plugged in” and will switch to the active input. I made a super simple audio mixer for mixing the MorphOS and Minimig audio. MorphOS audio is always active. Minimig audio is only active when it is running and active (it cuts out if you “alt-tab” to the desktop, or shut down). There’s also an internal speaker. Overall I am super happy with the result. It does what I set out to do, make the Minimig feel invisible and completely integrated with MorphOS. Of course, the sane approach would be to just use UAE instead but this has always been an excuse for me to learn more about electronics and micro controllers. 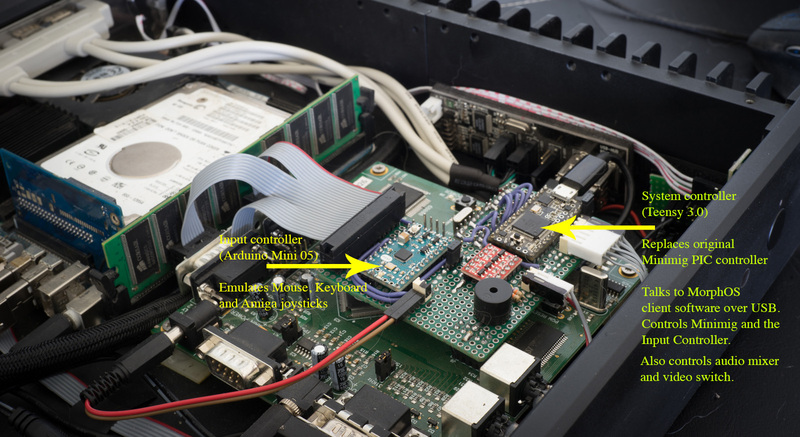 - Send mouse,keyboard and joystick directly to the FPGA over SPI, removing the need for the second micro controller and cable. 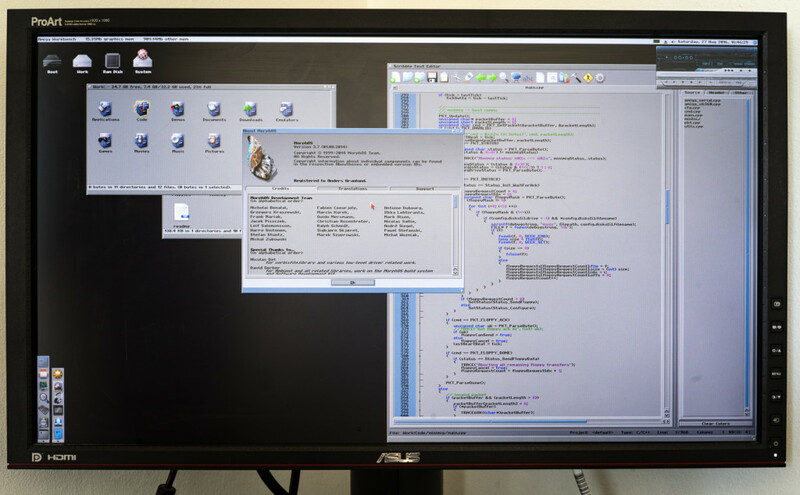 - Send picture from Minimig back to MorphOS (over ethernet?) so it can be displayed in a window. - Make a single card that does all the things (Minimig/MIST, video switch, audio mixer).